I know there are other show lovers out there who love the dark comedy TV shows like Psych. I get so excited when a crime style show has both a quick wit that keeps you on your toes. If you’re the same, you’ll love our list of 12 other shows to watch! Get a quick overview of the show, plus learn all about the awesome Psych cast! If you have never watched Psych before, I highly recommend you binge watch it one rainy weekend, or really anytime works! It aired for 8 seasons, so there are 120 episodes to watch! The series has something for everyone- crime, comedy, drama and mystery. Well, it focuses on Shawn Spencer, a 41-year-old guy who’s had more than 50 jobs since his high school days. Shawn has a couple of unique skills, however- an eidetic memory and powers of observation. These skills help him land a job at the Santa Barbara Police Department as a Private Consultant. Well, Shawn lied to get the Consultant job- saying he has psychic abilities that allow him to easily solve crimes! Shawn doesn’t have psychic abilities any more than you or I do. Okay, well maybe you really do have psychic abilities! I know I sure as heck don’t, although I sometimes wish I did! Shawn works as a Freelance Consultant with the Santa Barbara Police Department. He pretends to be a psychic and although he’s not a psychic, he does have an eidetic memory and amazing powers of observation. Shawn is constantly seeking attention and rarely takes anything seriously. He is the son of Henry and Madeleine Spencer and the boyfriend of Juliet O’Hara. 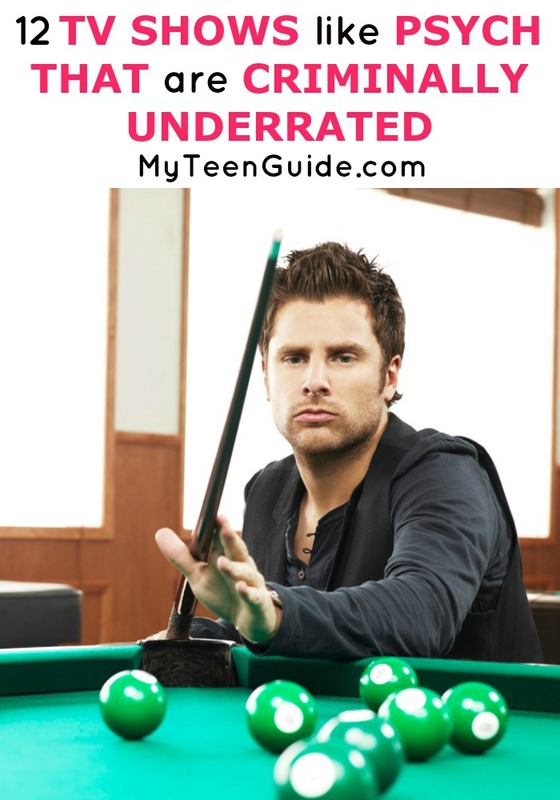 James Roday plays the role of Shawn Spencer. I absolutely love him, and I think he totally makes Psych fun and entertaining. Did you know that Roday also produced 89 episodes, directed 8 episodes and wrote 16 episodes of Psych? Burton is Shawn’s business partner and childhood best friend, who works as a Sales Rep for a pharmaceutical company. Unlike Shawn, Burton has a serious side and is also known to be extremely sensitive. Carlton is the former Head Detective of the Santa Barbara Police Department and the current Chief of Police for the Santa Barbara Police Department. Carlton has low self-esteem and a no-nonsense attitude. He is currently married to Marlowe Viccellio and together they have a daughter, Lily. Juliet is a former Police Officer with the Miami Police Department and former Junior Detective with the Santa Barbara Police Department. Currently, she is the Head Detective for the San Francisco Police Department. Juliet is the girlfriend of Shawn. Henry is a retired Police Sergeant and Police Consultant Liaison for the Santa Barbara Police Department. Henry is the ex-husband of Madeleine Spencer and the father of Shawn. Corbin Bernsen- who plays the role of Henry Spencer- is one of my favorite actors of all time. He is best known for his role as Arnie Becker on the television series- L.A. Law. But, here is something you may not know- Bernsen is the son of the late Jeanne Cooper. All of you soap opera fans will know Jeanne Cooper from her role as Katherine Chancellor on The Young and the Restless. From 1973 to 2013, Cooper played in 1,284 episodes of Y&R. Karen is the former Chief of Police for the Santa Barbara Police Department and the current Chief of Police for the San Francisco Police Department. Karen is the wife of Richard Vick and the mother of Iris Vick. There have to be some other Psych-o’s like me that are sad because they aren’t making any more episodes. If you love a show that can both get a little dark and throw it down while still being funny, you have to see my list of the tops shows like Psych to watch. Monk is a police procedural television series that also incorporates comedy and drama. It aired on USA Network for eight seasons, from July 12, 2002, to December 4, 2009. The series showcases Adrian Monk, a detective with the San Francisco Police Department, who has Obsessive-Compulsive Disorder (OCD), which gets in the way of his job most of the time. Chuck is a television series that combines action, spy, drama and comedy. It aired on NBC for five seasons, from September 24, 2007, to January 27, 2012. Once you start watching this show it will become one of your top shows to watch, I couldn’t turn it off. The series chronicles the life of Chuck Bartowski, a computer geek who unknowingly downloads U.S. spy secrets into his brain. Chuck stars Zachary Levi, and it’s available on Amazon Prime Video. The Good Guys is a police procedural television series that also combines action and comedy. It aired on Fox for 1 season, from May 19, 2010, to December 10, 2010. The series showcases the lives of Dan Stark and Jack Bailey, detectives who are assigned to work together. However, they are total opposites, with Stark being a drunken former big-shot and Bailey being young and ambitious. The Good Guys stars Bradley Whitford and Colin Hanks. Brooklyn Nine-Nine is a television series that incorporates police procedural with a sitcom. It premiered on Fox on September 17, 2013. The series chronicles the happenings of Jake Peralta, a detective with NYPD’s Brooklyn 9tth Precinct. Peralta is talented but very immature, which gets him into conflicts with Captain Ray Holt, who is stern and serious. Brooklyn Nine-Nine stars Andy Samberg and Andre Braugher. Better Off Ted is a television series that incorporates dark comedy and science fiction. It aired on ABC for two seasons, from March 18, 2009, and January 26, 2010. The series showcases the life of Ted Crisp, the Senior Vice President of Research and Development at Veridian Dynamics. Better Off Ted stars Jay Harrington. Bones is a comedy, crime, drama television series. It aired on Fox for 12 seasons, from September 13, 2005 to March 28, 2017. The series showcases the investigative team of Dr. Temperance “Bones” Brennan- a Forensic Anthropologist and Seeley Booth- an FBI Special Agent. Bones stars Emily Deschanel and David Boreanaz. I loved this show and even though Bones and Seeley were pretty much total opposites, they worked so well as a team. Bored to Death is a comedy, crime, mystery television series. It aired on HBO for 3 seasons, from September 20, 2009 to November 28, 2011. The series focuses on Jonathan James- a Journalist who becomes a fake Private Detective, just by reading old detective novels. Bored to Death stars Jason Schwartzman. I am just wondering who gets that bored that they pretend to be a Private Detective? Common Law is a comedy, crime, drama television series. It aired on USA for 1 season, from May 11, 2012 to August 10, 2012. The series showcases the partner team of Travis Marks and Wes Mitchell- Homicide Detectives with the Los Angeles Police Department. Common Law stars Michael Ealy and Warren Kole. Travis and Wes don’t like each other at all, so they are forced to attend couples counseling. In Plain Sight is a crime, drama, mystery television series. It aired on USA for 5 seasons, from June 1, 2008 to May 4, 2012. The series focuses on the life of Mary Shannon- a Deputy U.S. Marshal- who is trying to balance her professional and personal lives. In Plain Sight stars Mary McCormack. Leverage is a crime, comedy, drama television series. It aired on TNT for 5 seasons, from December 7, 2008 to December 25, 2012. The series showcases a team of sophisticated criminals- Grifter, Hacker, Retrieval Specialist, Thief and former Insurance Investigator- who stage intricate cons for regular citizens who have been victimized by corrupt businessmen and wealthy criminals. Leverage stars Gina Bellman, Aldis Hodge, Christian Kane, Beth Riesgraf and Timothy Hutton. Okay, I have 2 words for you– Christian Kane- who plays the role of Elliott Spencer! Surely, you’ve heard of him, right? Yes, he played the role of Lindsey McDonald on the television series- Angel and yes, he also played the role of Jacob Stone on the television series- The Librarians! But, did you know he is a country singer too? I am a huge fan of his music- especially his songs- The House Rules and Let Me Go. Go have a listen if you haven’t heard this guy sing! The Finder is a comedy, crime, drama television series and is a spin-off of the television series- Bones. It aired on Fox for 1 season, from January 12, 2012 to May 11, 2012. The series focuses on Walter Sherman- a retired U.S. Army Major, with a brain injury that gives him the unique ability to find almost anything and everything. The Finder stars Geoff Stults. The Mentalist is a crime, comedy television series. It aired on CBS for 7 seasons, from September 23, 2008 to February 18, 2015. The series showcases Patrick Jane- a former fake Psychic Medium, who now works as an Independent Consultant with the California Bureau of Investigation. The Mentalist stars Simon Baker. I think that out of all the TV shows, this one resembles Psych the most. Both characters- Shawn (Psych) and Patrick (The Mentalist) both lie about abilities they don’t have so that they can land a job as a Consultant. So which of these TV shows like Psych have you watched? I loved Chuck, it’s really well done. Monk has been on my list for a while to watch from beginning to end. Which show are you excited for? Sound off in the comments!